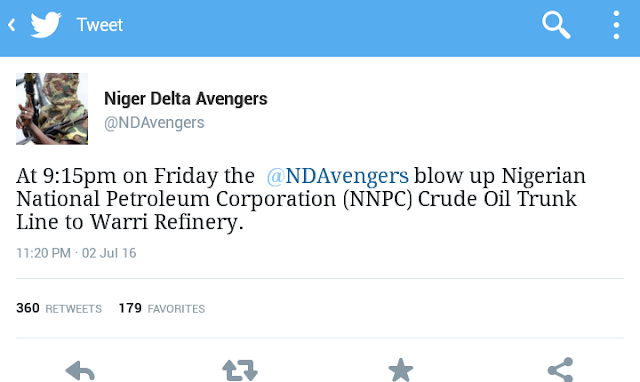 The Niger Delta Avengers who appeared to have gone solo after a long vacation of inactivity, has resumed hostilities in the oil rich region again by bombing five major pipelines belonging to NNPC, NPDC and Chevron oil company in Delta state. This great news came after the group's press release on saturday via Gen. Mudoch the Avengers spokesperson, where they refuted claim by the DSS that they have arrested some members of the group who happens to be "DSS Sleeper Agents" whom they refused to pay for doing their dirty work. The very tactful and deadly group didn't just destroy one, but five major pipelines all in Delta state. "At 9:15pm on Friday the @NDAvengers blow up Nigerian National Petroleum Corporation (NNPC) Crude Oil Trunk Line to Warri Refinery. 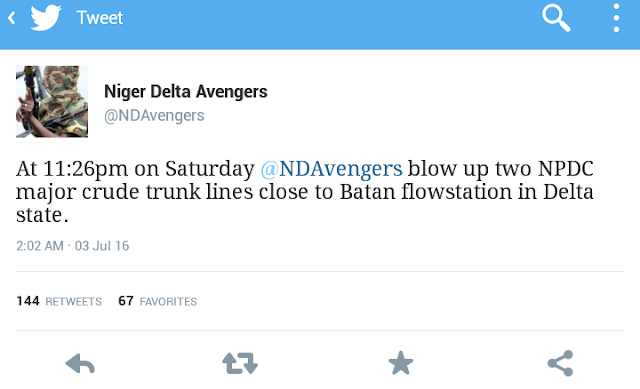 "At 11:26pm on Saturday @NDAvengers blow up two NPDC major crude trunk lines close to Batan flowstation in Delta state. "At 1:15am on Sunday @NDAvengers blow up two major Chevron Oil Wells. 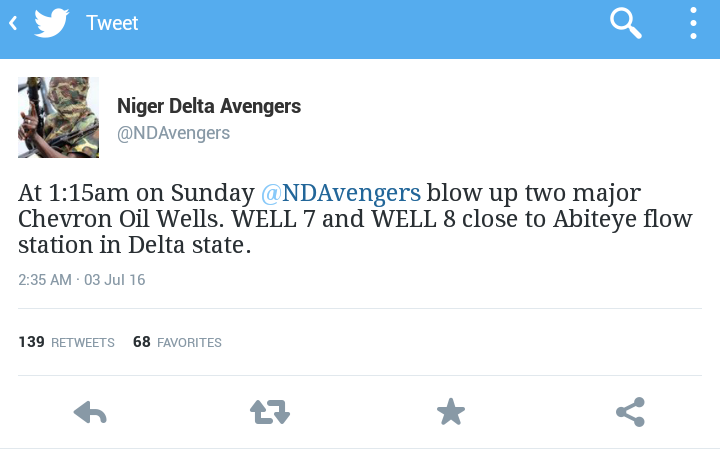 WELL 7 and WELL 8 close to Abiteye flow station in Delta state. "ALL FIVE OPERATIONS WAS CARRIED OUT BY @NDAvengers STRIKE TEAM. WELL DONE SOLDIERS." This latest report has once again showed that they are absolutely resolute to their mission, which is to cripple the economy of Nigeria; who has done nothing but marginalized, deprived, subdued and killed the natives of the oil rich region with high level of poverty unseen or unheard of to man. We the indigenous people of Biafra under the leadership of Nnamdi Kanu, hail our brothers the Avengers for displaying so much temerity and tenacity in fighting same cause for freedom. We urge them never to relent until the federal government of Nigeria meet up with their demands; among which include the release of the leader of the Indigenous People of Biafra, Nnamdi Kanu and the emancipation of the Biafran people, or the economy drops to zero level as promised. Biafra is the only solution to the whole problem. Let idea come! In Biafra we stand forever! These guys are just too much!!!! To me I think it just the beginning the zoo have not seen anything yet. All hail ND Avengers. God bless Biafra and no where else.